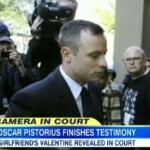 Dan was on Good Morning America Tuesday, April 15th to discuss Oscar Pistorius’ 7 day long testimony and cross examination that finally ended. Pistorius is currently on trial for the death of his girlfriend, Reeva Steenkamp, whom he is accused of shooting and killing in the early hours of Valentine’s Day 2013. He pleaded not guilty to the charge of murder and three other gun related charges. Pistorius claims he mistook Steenkamp for an intruder and shot out of fear for his life. At times during his testimony Pistorius became highly emotional but lead prosecutor, Gerrie Nel, did not back down when trying to show inconsistencies in Pistorius’ story. What did Dan have to say this morning on the topic? “He was a good witness. He was responsive, he was emotional at certain times, often at the right times, he withstood the cross examination and yet these facts are really problematic for him. There are real inconsistencies in his account and most importantly, and we need to take a step back here, he shot his own girlfriend in his home, four times, behind a door in his toilet. That in and of itself, is an enormous problem for Oscar Pistorius that he has not yet overcome.” Watch the full clip here.